It’s about time your business card had a makeover. Are you bored with the same-old business card design? Then it’s time to try oval business card printing. Our 3.5” x 2” oval cards are printed on thick 14 pt. cardstock and will be coated on one or both sides depending on your preference. This adds some much needed durability. They can be ready for shipping in as fast as two business days. You can order quantities from 25 up to 10,000 cards per order. You can select one of the coating options. You have matte coating that has a more subtle shine and high gloss UV coating that’s really glossy. Those who want something in the middle should choose gloss coating. Oval business card printing can make a difference in how you present your business cards. You should definitely give it a try. Designing business cards with unusual shapes helps you stand out from the competition. When you print oval business cards, you have the freedom to explore other design options that wouldn’t normally work with standard business cards. Add your oval cards to items being shipped out so customers can reach back out to you. Our cards are also great for conferences and conventions. 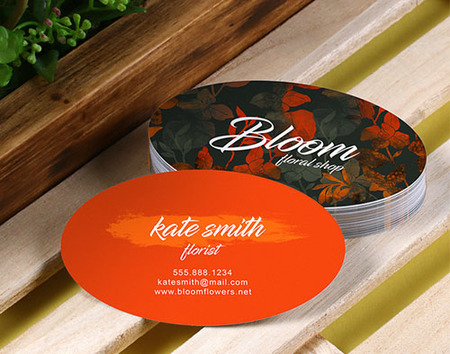 Oval business card designs work whether you want cards that look sophisticated or fun.